BUYSOUNDTRAX Records presents the original soundtrack to MOON 44, featuring music composed by Joel Goldsmith (STARGATE franchise, HELEN OF TROY, WITCHBLADE, CALL OF DUTY 3) for the 1990 science fiction film directed by Roland Emmerich (STARGATE, INDEPENDENCE DAY, THE PATRIOT) and starring Michael Paré (STREETS OF FIRE, EDDIE AND THE CRUISERS, THE PHILADELPHIA EXPERIMENT), Malcolm McDowell (A CLOCKWORK ORANGE, TIME AFTER TIME, BLUE THUNDER), Lisa Eichorn, Dean Devlin, Brian Thompson, Stephen Geoffreys, Leon Rippy and Roscoe Lee Browne. MOON 44 takes place in 2038. Multinational companies have taken control of the universe, constantly fighting each other for control of distant planets where their robots mine the priceless minerals which are now the only source of fuel back on Earth. The Galactic Mining Corporation is locked in a bitter conflict with a rival corporation, Pyrite, who have begun supplying pirates to attack GMC mining facilities across the Outer Zone of the universe. Moon 44 is one of their most lucrative mining operations and is projected to be the next target of the pirates. The GMC is tipped off that Moon 44’s mining shuttles are being hijacked and their shipments diverted. Their response is to send Felix Stone (Michael Paré), an Internal Affairs investigator, to look into the matter. When he arrives on the old rundown mining station, he discovers that his old girlfriend, Terry (Lisa Eichorn) is also working there. Terry is coordinating an experimental helicopter defense program with the questionable cooperation of the station's commanding officer, Major Lee (Malcolm McDowell) and his brutal sergeant, Sykes (Leon Rippy). Stone goes undercover to conduct his investigation as part of a group of Company prisoners who have been sent to Moon 44 to participate in Terry's program as pilots. The prisoners, led by Jake (Brian Thompson), Moose (John March) and Scooter (Jochen Nickel), have volunteered for the program to shorten their sentences. The reason for Terry’s defense program is the external atmosphere on Moon 44, which is horrendous. Hurricane force winds constantly race through rain-swept canyons, across a foggy surface mostly devoid of daylight, making conventional flying impossible. The prisoners, unaware that most of the pilots who volunteered before them are dead or maimed, are introduced to their co-pilots, a group of station-bound navigators. For the program to succeed, the pilots must work together with the navigators to overcome the flight problems that come with the harsh weather on the surface. Of course, the prisoners and the brainy young navigators clash instantly. Convinced that the ongoing theft of the station's mining shuttles is an inside job, Stone sets a trap to try and uncover the identity of the collaborator and Staff Sergeant Sykes walks right into it. In the ensuing struggle, Major Lee intervenes to save Stone's life. His subsequent behavior, though, convinces Stone that Lee is the one ultimately responsible. Believing he has enough information to close his case, Stone is about to return to GMC Headquarters to file his report when the mining station is suddenly attacked. Unaware that Major Lee has been given orders to launch all the mining shuttles and save Moon 44’s precious cargo if the station is attacked, Stone finds himself fighting a war on two fronts. The station must be defended against Pyrite’s drone fighters and Stone must somehow stop Lee from launching all the mining shuttles or everyone will be trapped on the station. 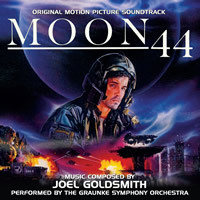 The score for MOON 44 was composed by Joel Goldsmith and was his first major orchestral score for a film, foreshadowing his later work on science fiction projects such as STARGATE SG-1, STARGATE: ATLANTIS and STARGATE UNIVERSE. The score was performed by the Graunke Symphony Orchestra, conducted by Christopher L. Stone, with orchestrations by Stone and Jack Smalley. Originally released on compact disc by Silva Screen Records at the time of the film’s release in 1990 and long out of print, BUYSOUNDTRAX Records now brings MOON 44 back to compact disc again, newly remastered by James Nelson of Digital Outland. MOON 44 is a limited edition of 1500 units.